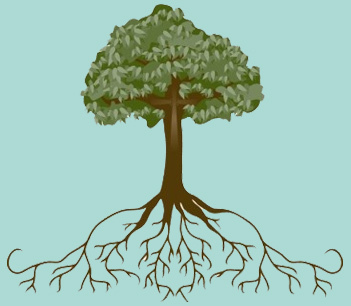 The roots of TampaPix literally began with roots. In the late-1990s, I was member of a genealogy website mailing list on "RootsWeb" where the topic was Hillsborough County genealogy. The mailing list was a convenient way to send messages to all the members and hopefully, find someone who could provide information about my family. Now and then, members of the mailing list reminisced about bygone places in Tampa, and the topic turned nostalgic. One day, members strayed off-topic and were reminiscing about various places in Tampa where they lived, or hung out. Many messages were from Tampans who had moved away long ago, and wondered if some of their old haunts were still around. One day in early June of 2003, a member sent out a message asking if the Goody Goody restaurant was still around. Another member answered that it had closed years ago. I knew it was still open because I passed by it every day on Florida Avenue on my way home from work. But I just didn't want to post a reply saying it was open, I wanted to prove it. So I stopped in at the Goody Goody and took the photos which you see here. 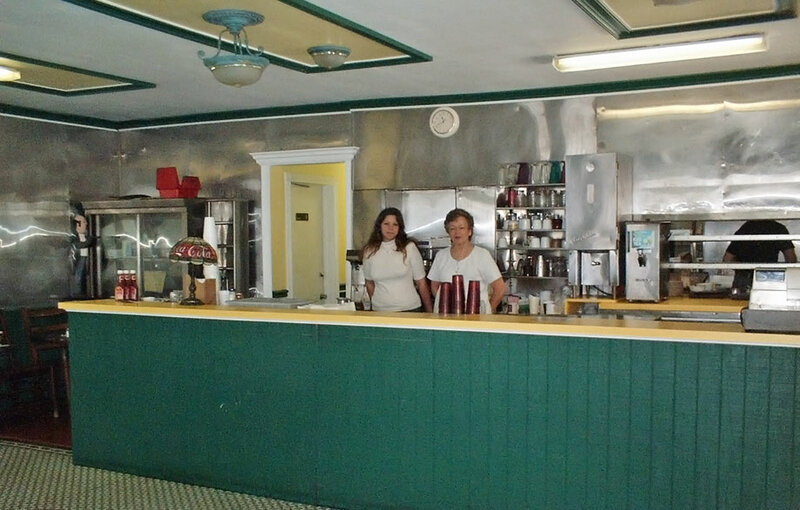 The Goody Goody as it appeared on June 13, 2003, before the renovations. One can see why some would think it had closed, but repairs had just begun. This is the first photo posted at what would become "TampaPix.com"
These photos are presented here much larger than originally uploaded in 2003. The photos uploaded in the early years were quite small, reduced to very low resolution due to the relatively slow Internet connection speeds and limited bandwidth initially provided with my first web hosting account. In those days, I used a Fuji Exif A100 digital camera with at most, 1 or 2 megapixel capability. Yvonne Freeman, on the right, was the manager of Goody Goody for many years; she leased it from Mike Wheeler, the owner. Then I had to figure out a way to put the photos on the Internet. In those days, I had a friend who owned a courier service who needed a website, so I designed one for him as a favor, faithfuldeliveries.com. He graciously allowed me to upload my Goody Goody photos to www.faithfuldeliveries.com/goody.htm. 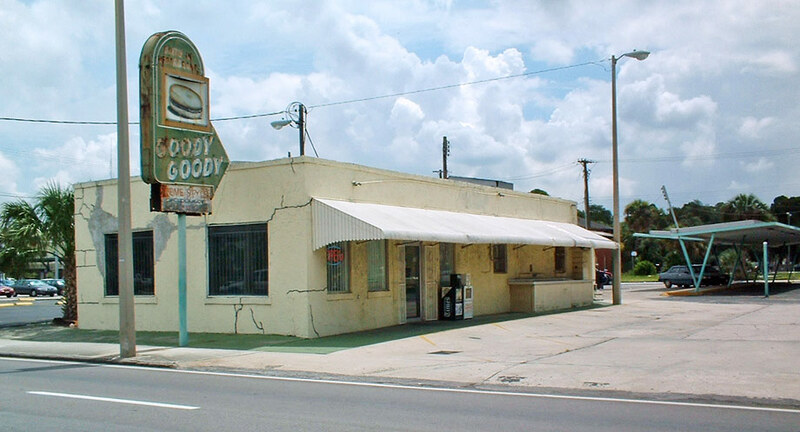 I then replied to the RootsWeb Hillsborough County Genealogy email list that Goody Goody was indeed still open, and provided a link to the photos. The response was surprisingly overwhelming. Not only from those who had such good times and memories there, but from many others who had moved away from Tampa and wondered if other places of their youth were still around. I received emails asking to see photos of other places of interest; Hillsborough High School was another popular request, as were some for photos of homes where some members used to live. In the course of driving around Tampa to photograph these various locations, I began to realize how many beautiful and interesting landmarks there are in Tampa, and started to wonder about the history behind them. I began to photograph them and research their past. Within a year, I found out how simple it was to obtain a domain name and web hosting account. I initially wanted to use "TampaPics" but that was taken by someone who obviously purchased the domain to make a profit by reselling it. So I chose "TampaPix" instead. 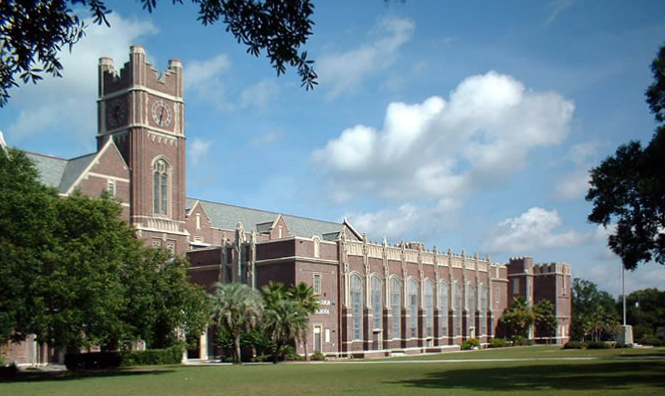 In the next two or three years, I became interested in the history of Tampa and sought out to bring it to the public view by featuring various other interesting Tampa landmarks such as the Sulphur Springs Water tower, Union Train Station, and the Tampa Theater building. The TampaPix logo is an adaptation of the Tampa Theater marquee sign. At the same time, while researching my genealogy, I found that the lives of my ancestors were very much entwined with the history of Tampa and the cigar industry. 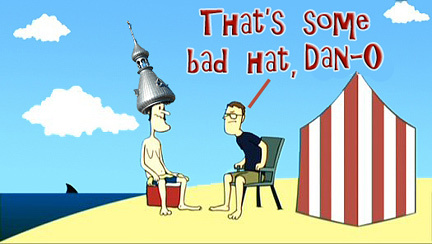 This was the first home page "banner photo" used at TampaPix, 2004. This downtown view was taken from a 6th floor balcony of the One Harbour Place office building on Harbour Island. It's actually 3 photos seamed together. The left seam is just left of the cylindrical then-NCNB tower, midway between it and the antenna just to the left of it. The right side seam runs through the right edge of the Marriott hotel tower. Now, everything to the right of the Marriott is obstructed by condos that were getting ready to be built in the vacant lot you see on the right. Before this photo, the home page of TampaPix was the Goody Goody feature. The discovery of the Burgert Brothers photo collection at the Tampa-Hillsborough County Public Library website became a turning point in TampaPix history. The collection is a valuable resource that provides over 15,000 images of Tampa's past. It spurred my desire to showcase some of the photos and delve into the history of the places appearing in the photos. In this respect, the USF Digital Collections provided another excellent source of old Tampa photos. A recent TampaPix feature spotlights the Burgert family and their works. TampaPix is my hobby and combines some of my favorite interests: photography, genealogy, history, origin of street names, and in the course of digging into Tampa's history, interesting "trivia" about Tampa. The "Did You Know?" features at TampaPix were the result of learning about (and often, stumbling upon) unique and interesting facts about Tampa and persons of note whom I discovered had some sort of tie to Tampa. The "What's In A Name" features at TampaPix give an insight into why some of Tampa's thoroughfares are named as they are, and about the persons they were named for. At the time I was a member of the RootsWeb mailing list, a member who lived in Cuba posted to the email list members for help researching her grandparents and parents who lived in Tampa. Having lost important family documents during the revolution, she was seeking sufficient proof that her family was from the U.S. In the course of assisting her, she began emailing me photos of Havana and the surrounding area which were taken by her husband. I was surprised at the beauty of the locations, having the preconceived belief that all of Cuba was run down and deteriorating. With her permission, I created a special section of TampaPix for her photos. They are displayed for one of the same reasons I display photos of Tampa--to show the many beautiful places there. Yes, I know there is poverty and despair in Cuba, but this is everywhere, even here in Tampa. Other photos of Cuba were sent to me by a U.S. citizen who lived in Philadelphia and travelled to Cuba with government permission. After seeing the TampaPix photos of Cuba, he offered to send me his for display. Those photos appear at "More photos of Cuba" here at TampaPix. This feature was a direct result of my interest in genealogy research and an unintended discovery resulting from helping the friend in Cuba which I mention above in "Photos of Cuba." In searching for records of her brothers' births in Tampa, my Cuban friend mentioned that both of her brothers were delivered by a midwife. I learned that the local Family History Center in Tampa had two reels of midwife records from the early 1900s, and when I viewed the films, not only did I find the birth records of her brothers, I found one reel had an image of a letter from the LDS church thanking the submitter for sending the records for scanning. The submitter, Salvatore Greco, lived nearby, and so I wrote him a letter to thank him also. Salvatore was a cousin of the husband of the midwife, Maria Messina Greco. The letter led to my being invited to visit him and his wife, who gave me the actual original record booklets. During the next year or so of trying to transcribe the thousands of records myself, several offers were made to me by friends expressing an interest in helping. I was hesitant to part with the records, until the then-editor of Cigar City Magazine, Marilyn Esperante Figueredo, contacted me and made a very appealing proposal. I met a few times with her some time in late 2004 and 2005 and was impressed by her genuine interest in preserving the records. Through the many friends and contacts of Cigar City Magazine, she offered to arrange to have the records preserved, not just physically, but in transcription also, to share with the world on the Internet. I happily donated the records to the magazine with confidence they would be protected and shared. Unfortunately, Marilyn passed away before much could be done with the records, and she never saw her plan come to fruition. The records were "inherited" by another magazine staff member, who initiated the two-year-long painstaking process of transcribing the records. Read the remarkable story of the history of these records and the tedious transcription process undertaken by dedicated local Italian Society volunteers. 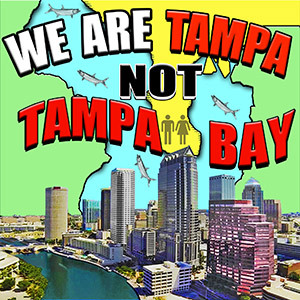 In 2009, I became affiliated with a Facebook group called "Tampa Natives." Many of the features found at TampaPix have been shared in a bit less detail with the Tampa Natives page, but even more Tampa photos along with background history, which are not featured at TampaPix, have been added to Tampa Natives. The thousands of photos uploaded to Tampa Natives by fans and admins are indexed here at TampaPix for ease of searching and viewing. 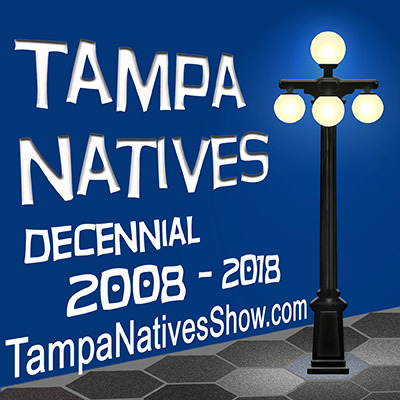 Another unique feature of Tampa Natives is the Tampa Natives Show, having made broadcast history in May, 2013, with its 100th episode. Then hosted by three Tampa natives, the show was the only one of its kind that features an opportunity for viewers to call in live and share their memories of living and growing up in Tampa. The show often showcases old photos of Tampa's past--many sent in by Tampa Natives fans and viewers. 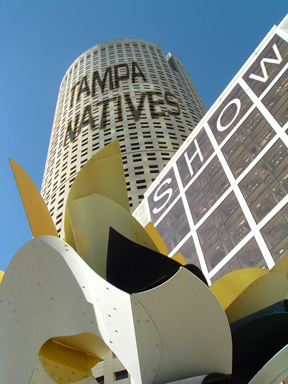 Each show has a main theme, and often viewers are treated by the appearance of a special guest on the show, who is well-known to Tampans, and shares their Tampa experience with viewers. I hope you find TampaPix entertaining, but even more so, interesting and educational. Through the years, offers have been made by various individuals and companies to pay me for allowing their ads or banners on my site, and I turn down each and every one of them without a second thought. TampaPix is not for income or profit. It exists to show the world the beauty of Tampa and its rich past. Any existing businesses featured at TampaPix are featured only because I found the establishment to be an important or interesting part of Tampa's culture, history or beauty, and not because I was approached by the owner or representative. I appreciate your constructive input and correction on any misinformation I may have provided at TampaPix. A vast majority of the information I present at TampaPix comes from online sources, after having considered the reliability of the source. Some information comes from my own experience and knowledge, having lived in Tampa all my life thus far. Several features at TampaPix have been updated with photos and/or information sent to me by persons who had seen the original feature, and being directly involved with the place, or were descendants or relatives of persons I've featured, and have contacted me with valuable and exclusive additional input. I have some friends who wish to remain anonymous, who have graciously assisted me through the years with ideas for TampaPix features, along with historical information, photos and even Tampa memorabilia. I take this opportunity to thank them publicly. Please note that I'm not interested in offers to increase standings in search engines, foreign or domestic. I'm also not concerned with any web-related errors your "W3C Validator" may have found or any "tweaks" you think I should make concerning my web design. If you wish to contact me concerning the content of any features here, such as correction to historical information presented, feel free to email me!